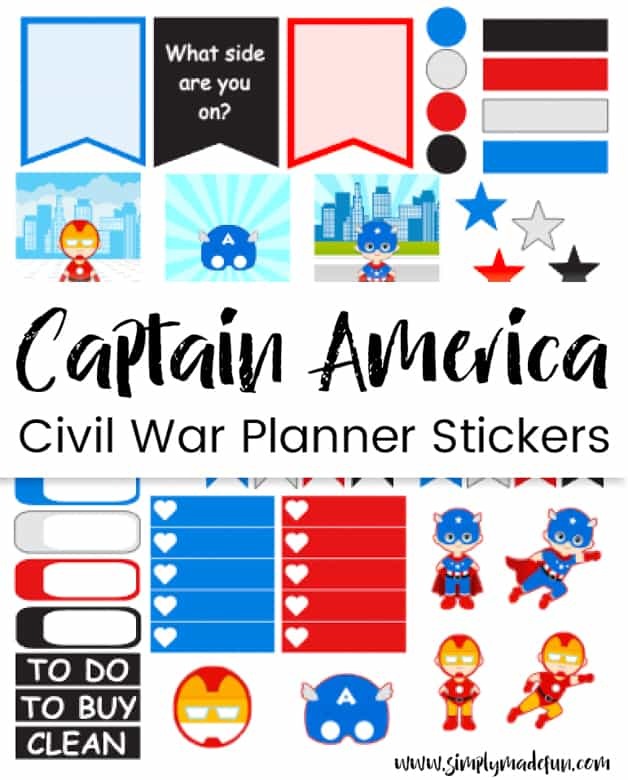 Print and cut your own Captain America planner stickers & deck out your Erin Condren Life Planner just in time for the new movie, Captain America Civil War! Chris and I are huge Marvel fans and have been excited for the new Captain America movie for months. To keep the excitement going in our house we love to watch Agents of S.H.I.E.L.D. and have been huge fans of the Inhuman storyline. As the new Captain America movie has gotten closer we’ve been anxious to see how they tie the storyline from Civil War into the show, and y’all….it’s getting so good. And now that I’m seeing how crazy some of these Inhumans are, I’m totally on Iron Man’s side. I’ve never read the comics and only got into the Marvel franchise way back in 2009 when Chris and I started dating, so I’m still pretty new to the whole universe. So I really don’t know what is going to happen in Civil War, only that Iron Man and Captain America are on opposite sides of registering those with powers….and that there will be some epic battle scenes coming. I mean, it is Marvel after all! To celebrate the movie, I made new stickers for my Erin Condren Life Planner. And I made enough to cover the entire month of May so I can celebrate my favorite Marvel movie all month long! Oh joy! Are you a Marvel fan? If you are, you can print out these sweet stickers to! And what’s even better, you don’t have to use them for your EC planner. 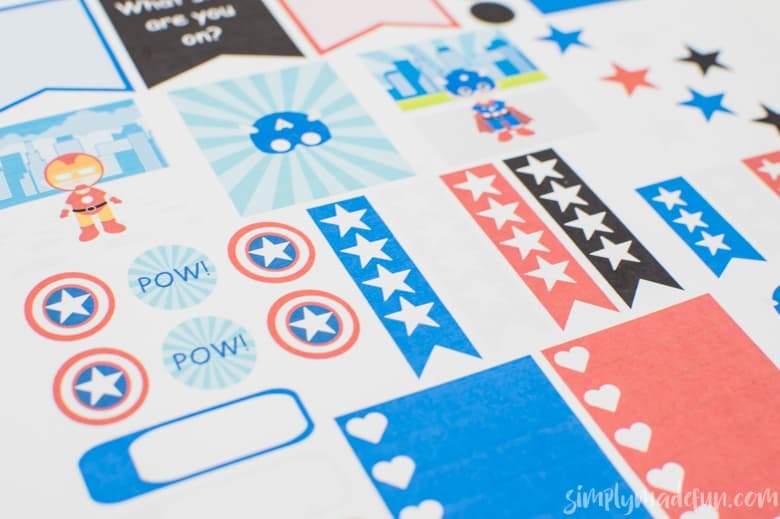 If your kiddos want the stickers to play with, you can use them for that to. But these stickers do fit perfectly in your Erin Condren horizontal planner. So….use them however you wish! 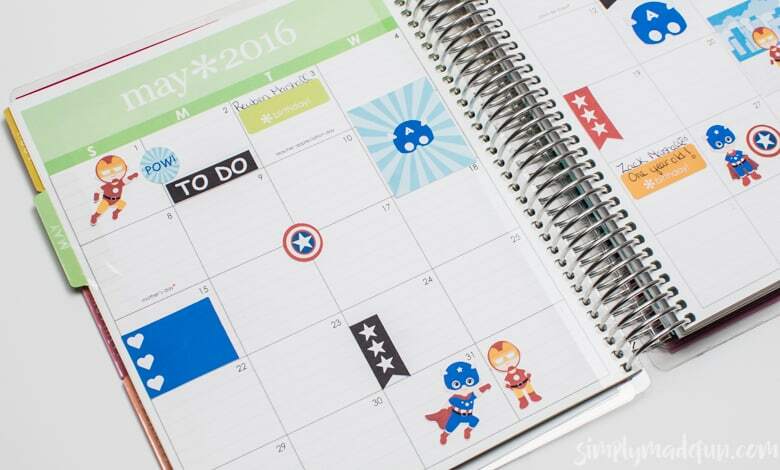 Download your own Captain America Planner Stickers! And if you’re wondering how to print and cut them out check out my tutorial on this post. It’s super simple! Huge shoutout to Cutesiness for these adorable Superhero files. Check out the Etsy shop for these types of files and more, I may have bought a few different designs so that I can bring y’all even more awesome printables! Now that my planner is all decked out in Marvel goodness, I’m ready for the movie! Now I’ve just got to wait a few weeks to see it. We decided a Disney vacation was a must so we won’t be around for opening weekend. And my mom, our built-in babysitter, can’t come up for a few weeks. Here’s to hoping Chris and I can hold out for a few weeks to see the new movie. We can’t wait! Are you excited for the new Captain America movie? Which side are you on? These are adorable! We are huge S.H.I.E.L.D. & Marvel fans too! Very cute! Your planner is so fun =) I will see the movie eventually. Well this sure seems to be a hot thing right now. Cute planner….I’m sure lots of kids will like it. Oh my goodness! These are precious! Thanks for sharing! Super cute! I love your planner… always wanted an Erin Condren one! This is so cute! I have a nephew obsessed with Captain America and he would love these! These are such fun and colorful stickers! I know so many people who really love their Erin Condren planners – I may have to get in on this party. Soo cool! We can’t wait to watch Capt. America this week. Really cute idea, really need a better planner myself. These are so cute but they only download as a studio3 file. Is there anyway to download them PDFs?